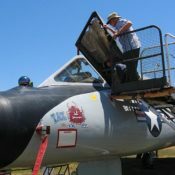 The Pacific Coast Air Museum is an easily accessible open-air, family-friendly museum that displays over 35 historic aircraft. Discover aviation history and technology! Learn what it was like to fly these planes from the men and women who actually flew them! Celebrate a special child's birthday or other event with a private party! Kids love the Pacific Coast Air Museum! The Museum is located on a five acre parcel at the Charles M. Schulz-Sonoma County Airport and is open five days a week year-round. This is a “hands-on” museum. In most cases you can walk right up to the airplanes, helicopters, and equipment, and touch them, look inside them, and see what made them work. 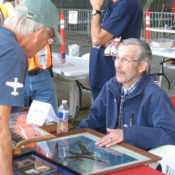 This makes the Pacific Coast Air Museum one of the best activities for children and families in the greater San Francisco Bay Area. On your visit to PCAM, you’ll find a collection of authentic, well-cared-for aircraft. You can crawl under them, look inside wheel wells and bomb bays, peer into cockpits, and examine all the details. Some of our aircraft flew on historically significant missions, including Operation Bolo in 1967 and defending New York after the September 11, 2001 terrorist attacks. The Pacific Coast Air Museum is one of the few air museums in the country to maintain a fleet of flying aircraft. Ours is small but growing, consisting of two piston-engined military aircraft, a few classic civilian aircraft from the end of aviation’s Golden Era, and some more modern civil aircraft. All aircraft are maintained to rigorous FAA standards by our certified mechanics and Flight Wing volunteers. Anyone is welcome to join, regardless of age or experience. PCAM maintains a collection of permanent and semi-permanent exhibits. 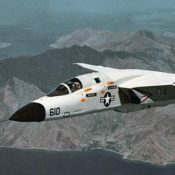 We have rare photos, cutaway jet engines that show their inner workings, numerous artifacts of “Golden Age” and World War II flight, a large collection of model aircraft, and most importantly our F-15A “First Responder” exhibit. Our premier exhibit is the F-15A “First Responder,” which was the first fighter jet on the scene over New York City the morning of September 11, 2001. This is the actual aircraft that took to the air that dreadful morning to provide protection to the people of Manhattan, and you can see it right here at PCAM. A large part of the PCAM mission is to educate both children and adults on our aviation heritage and space technology. To that end, we offer a variety of educational programs. The Museum is a favorite field trip destination for regional elementary schools, we hold a Boy Scout Aviation Merit Badge class, and we have special events and guest speakers. PCAM maintains a library stocked with several hundred books about aviation and related fields. All books are donated. The library is for member use only. The Museum gift shop carries a variety of aviation-themed clothing, hats, models, toys, and memorabilia of your visit to the museum. 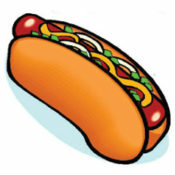 Proceeds go towards museum operations and improvements. 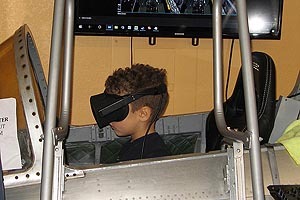 Our highly realistic 3D virtual reality flight simulator puts you in the cockpit of a P-51 Mustang, F-15 Eagle, and other historic aircraft!